There’s been a lot of buzz lately about the new social media darling Pinterest. The online pinboard is growing quickly and according to a new report from Compete, Pinterest is also driving a lot of traffic to other social networks. 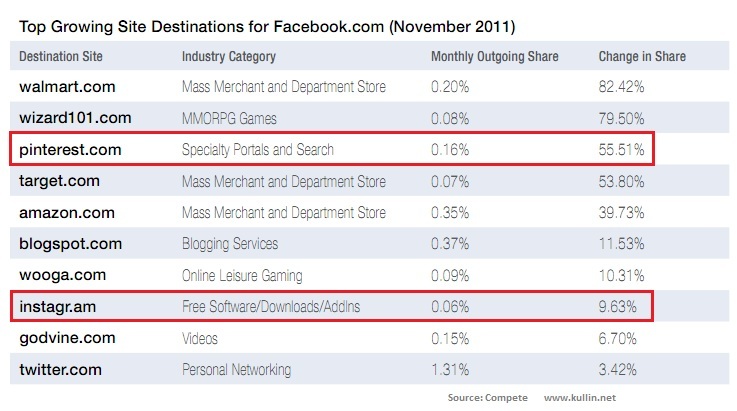 People are sharing images and videos on Pinterest which in turn drive traffic to sites like Facebook. According to the State of Social Media report from Compete, Pinterest delivered 1.7 million visits to Facebook in November 2011, an increase by 62%. As a comparison, that is almost double the amount of referrals from an established site like Yellowpages.com. In this social ecosystem, social networks in turn drive traffic back to Pinterest. It is quite interesting to see that Facebook is already driving more traffic to Pinterest than to Instagram (0.16% share vs 0.06%). And this was before it was announced in January that Pinterest was among the sites that could start auto-update to the Facebook timeline, which possibly means that more images are now shared on Facebook than in November. 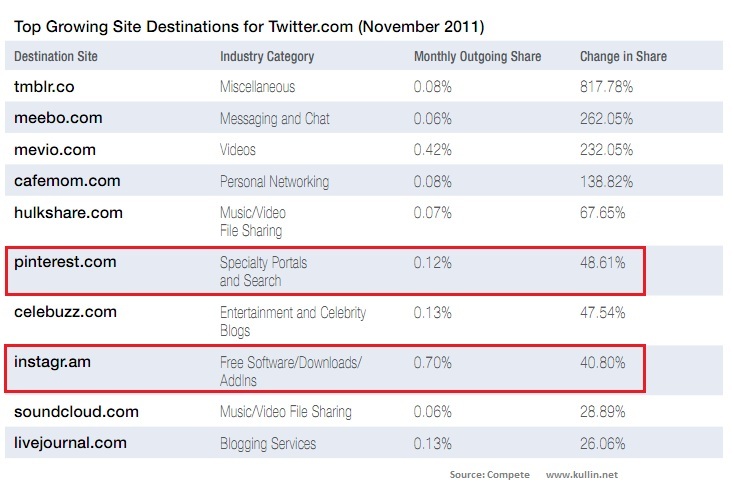 Twitter on the other hand is still driving more referrals to Instagram than to Pinterest. According to TechCrunch, a large portion of Pinterest users in the US are 18-34 year old upper income women from the American heartland which may explain why some of the more popular categories on Pinterest are food, pets, hair & beauty and travel. Another explanation can of course be that Instagram mainly is an app and that its web presence is not very good. When you click on an Instagram photo there’s hardly no way to get that user to keep on browsing on the site. You can’t even click on my name and explore more of my photos, so visits to www.instagr.am is not at all encouraged. On Twitter, Instagram photos are viewable within the site and in for example TweetDeck (but I don’t know if that counts as a “visit”). Also, a tiny but important detail. When you tweet a photo from Pinterest, it doesn’t include the caption in the tweet, which might reduce the willingness to push the send button. Fix that, and I am sure more people will share pinned images on Twitter. Note: Swedish readers may want to read this story about how Pinterest is driving millions of visits to a blogger.